One of the coolest things about being a mom is seeing the magic of every holiday through my daughter's eyes. If you're like me, though, you're constantly looking for holiday treats and gifts that are wholesome, educational, or a little bit offbeat. Here is the ultimate list of FIFTY(!) 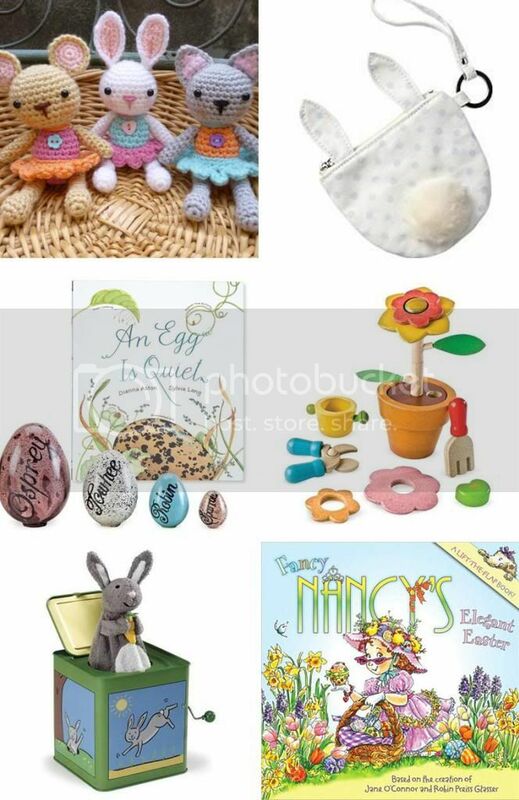 great Easter gift ideas for kiddos. Bonus: Not a speck of sugar in sight! 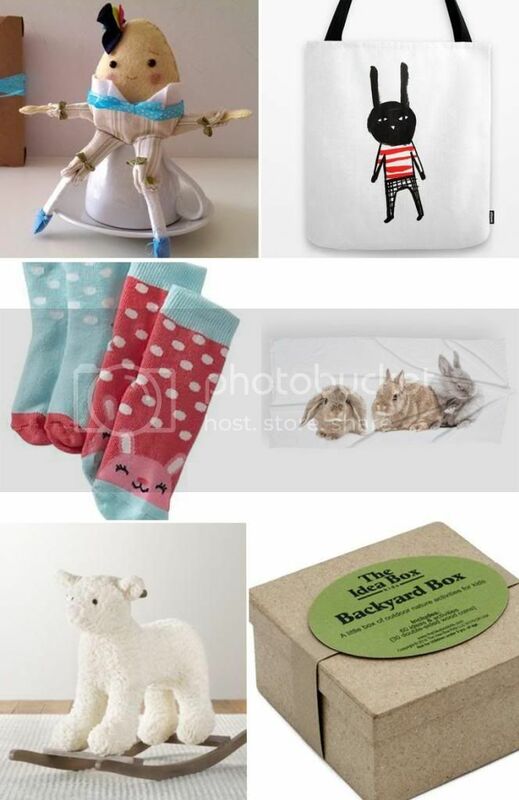 Waiting on Martha's Pico Bunny Pillow is 50% cuddly toy, 50% home decor, and 100% adorable. Piggy Paint is non-toxic nail polish formulated just for little ones, and this set is the perfect basket stuffer. This graphic tee from Old Navy is adorable with its hipster hopper, but totally wearable well after Easter. Sidewalk chalk in the shapes and colors of the season are sure to be a hit. Does this handmade bunny coat come in my size?! Eggy magnets. With moustaches. I want. Similar to the chalk above, but these shiny, swirly egg shaped crayons will work even if your sidewalks are still snowy! Am I too old for these Easter egg inspired rubber duckies? Wait, don't answer that. Baby's First Easter? Enter baby's first carrot-shaped squeaky toy. It's a thing, I swear. Bunny jammies. Perfect for getting in the spirit the night before! Cutest little rag-tag gaggle of finger puppet pals that I ever did see! The most adorable bunny-emblazoned melanine tableware set, another gem from Waiting on Martha. Because even the littlest of Easter brunch guests deserve a beautiful place setting. 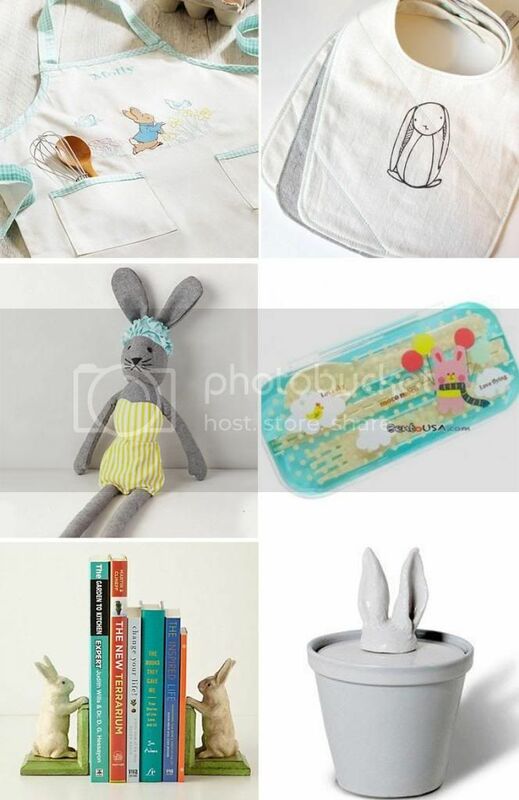 Anthropologie is offering the entire Peter Rabbit story collection in one beautiful, perfectly pastel box set. Swoon. Melissa and Doug can do no wrong. This gardening set made just for mini hands can be monogrammed! I have no idea what you would even do with this little needle felted bunny dude. But damn, he's cute. For older girlies, sweetly tinted pink balm in a bunny-shaped tube should do the trick. It's Boo. Wearing bunny ears. Commence the giggling. So this one has candy in it, I know, but those sweet little bunny-topped jars are a super easy DIY and you can fill them with anything! Wouldn't they be a darling stash for some more toy animals or dinos? These interactive books from Hallmark are awesome. We got Cassidy the Pony for Delaney and she just thinks her toy's reactions to our reading the story is pure magic. This one is perfect for Easter! This tic-tac-toe game is adorable and would be a great travel or restaurant activity. Is your kiddo obsessed with dress up play as mine? 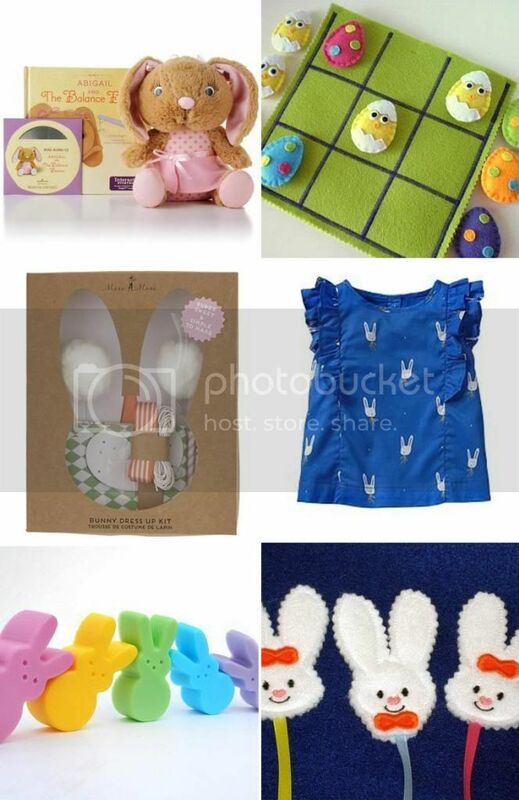 If so, Land of Nod has you covered with this bunny dress up set. Gap Kids is the best for holiday themed clothes that are still chic and not goofy. I would wear this top! They're Peeps! They're soap! They're Peep shaped soaps! Widdle bunny bookmarks! These will fit nicely in those little plastic eggs. Humpty Dumpty sat on a wall. Humpty Dumpty was pretty darn cute and made a great Easter gift. This Bertrand the Bunny tote is an excellent alternative to the traditional basket. Mostly because his name is Bertrand. Bunny socks for those hippity-hoppity feet. Beach and pool season will be here before you know it! This towel from H&M has you covered. This sweet little ride on toy from Restoration Hardware is both beautiful and fun for little ones. The Backyard Box contains 30 double sided coins with outdoor play ideas. That's sixty ideas in one box! "I'm bored" claims be banished! Another hit from H&M, this bunny bedding looks almost as snuggly as the real thing, and much lower maintenence. Three little bunnies to paint and decorate, if the kiddos aren't all decorated out after the eggs! 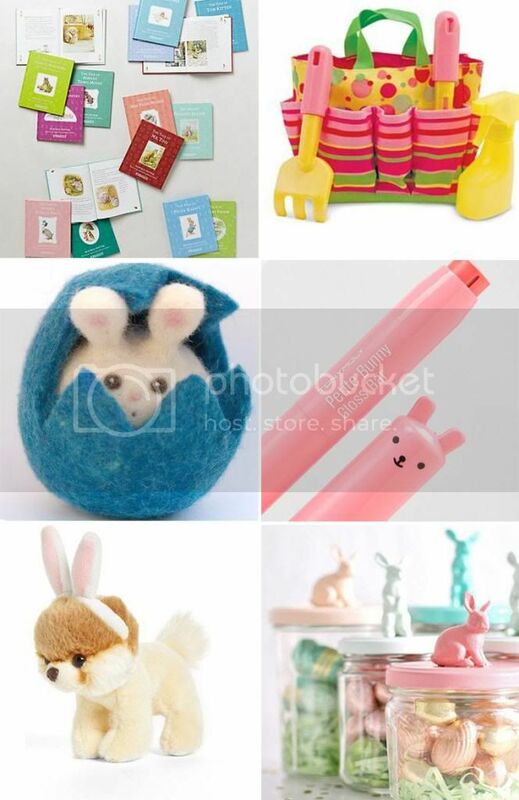 Sweet little bubble blowing bunnies, the cutest for nursery wall art! For all those tough little hipster kiddos out there, bunny tats. The Princess and the Pea playset- leave it to Anthro to bring a classic children's story to Easter perfection with a bunny princess! With its neutral colors and graphic lines, this onesie is perfect for the most discerning of baby stylists. A mini apron with a mini monogram. Oh PB Kids, you never fail me. This organic bib set is perfect for the same kiddo rocking the onesie above! A bathing beauty bunny. Because. Kawaii is a Japanese word meaning, loosely, "adorably ridiculously, almost painfully cute". This bunny bento box is totes kawaii. Another hit from Anthropologie, these bunny bookends would be great paired with the Peter Cottontail set! And another beauty from Waiting on Martha! 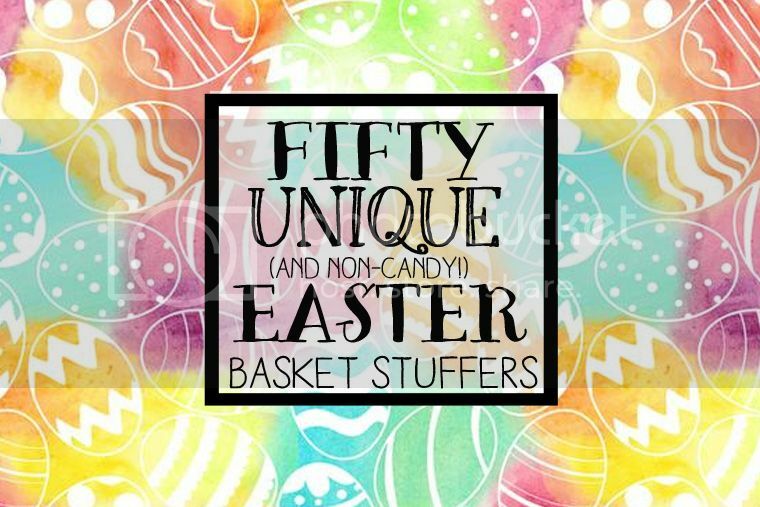 This bunny ears canister can hold any number of Easter treasures. Tiny crocheted buddies for your best little buddy. How cute is this Gap Kids purse? Love that little cottontail puff! An Egg is Quiet is a great educational set that comes with four life-size nesting eggs that could double as pretty Easter decor. This Build a Flower set is great for the littlest of gardeners. 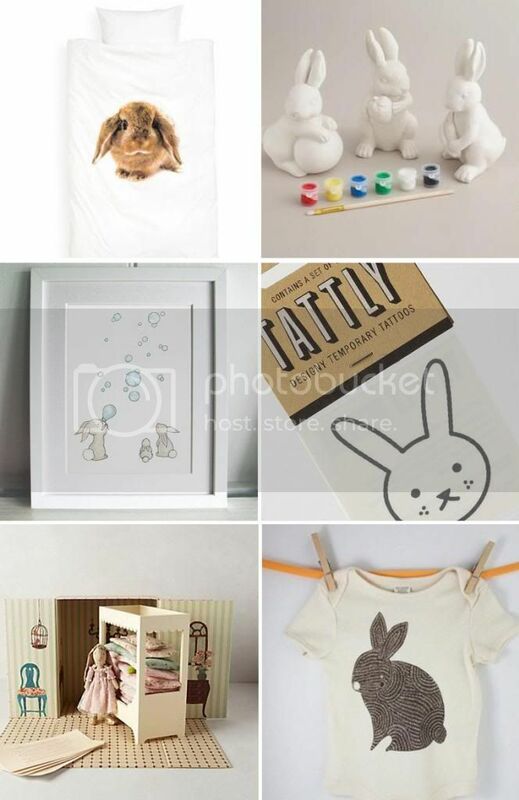 Who needs a jack-in-the-box when you can have a jack-rabbit-in-the-box? Delaney's personal hero, Fancy Nancy, is back with an Easter adventure, and it's a lift the flap book! 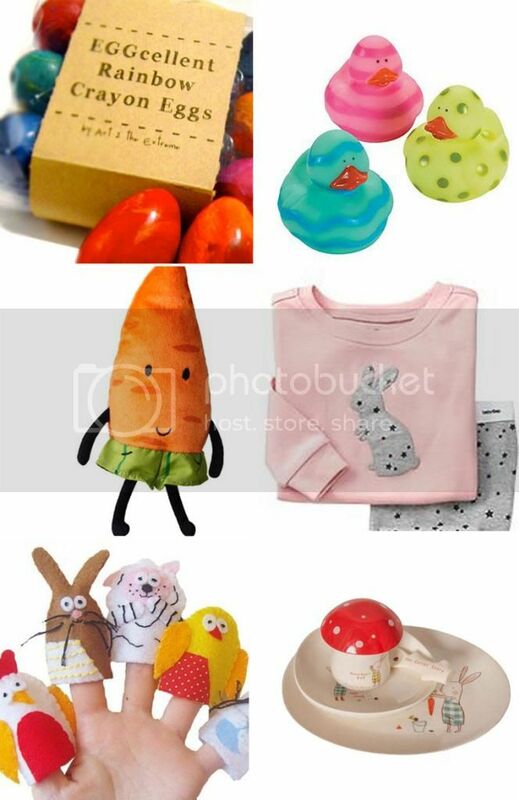 Cuteness overload with these coordinating Pj's, bunnies, and baskets for both boys and girls that can all be personalized with your little one's name! 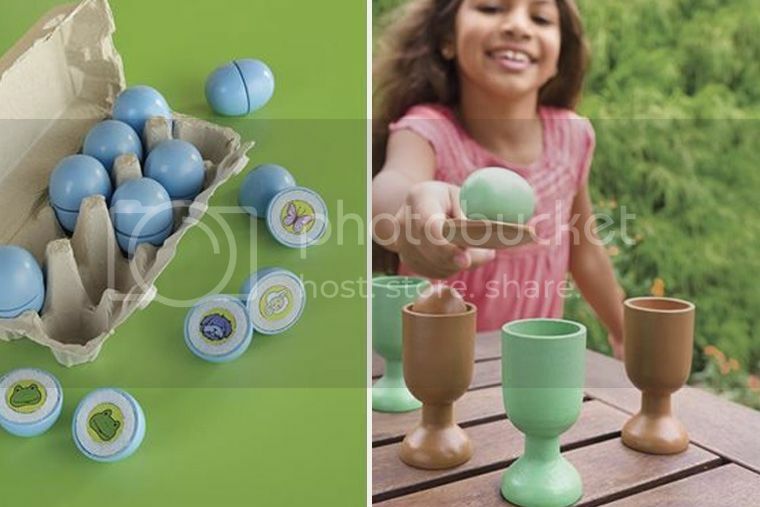 A cool new take on the traditional Memory games, this magnetic egg set is both beautiful and educational! Win-win! Finally, I love the simple beauty of this wooden egg race set. And it's definitely not as messy as the real deal! Whew! There you have it! 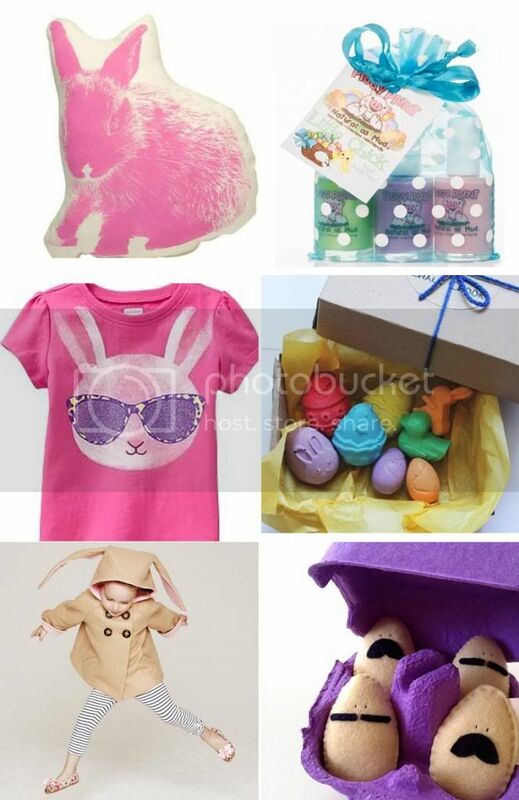 My thoroughly researched, exhaustive list of the 50 best unique Easter gifts for kids. What did I miss? We would love to hear your ideas too! Let us know by giving us a shout out on Facebook!